let's face it, it's NEVER easy to talk about yourself, but it's SUPER easy to talk about someone else. am i right or am i right?!?! 1st things first: julie is taller in real life than what yall would expect. that's one of the first things i ever said to her when we met in real life. 2ndly: julie lives in philly. yep. home of the cheesesteak. but she doesn't love cheesesteak, she loves candy. i mean she really loves candy. yall should ask her about her monster sweet tooth sometime. and lastly: she's an amazing quilter/designer/blogger. she's been featured in/on a few of our fav magazines. she even got to hang out with mark lipinski. yeah THE mark lipinski...she's THAT cool. i could go on & on, but yall should stick around to get to know her. she's so cool she could melt ice cubes. Yup.. that one.. it's for you. they are coming to dinner too. and there is 3 of them... so everybody slide on down a bit. ok so are you ready for the fabric treats? 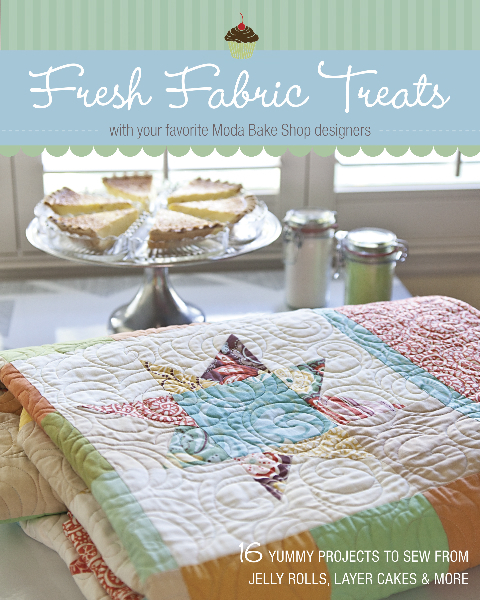 ?the fresh fabric treats...see that pretty cover quilt? no i didn't make it... but my bff rachel did!! woo hoo! i'm not great at keeping secrets... so it wasn't easy for me to not tell you about this book for the past year!! by now you have probably read all about how we have had to be quiet for so long... so i'll get on with it. please make sure your e-mail address is not set to "no-reply" or that you list your e-mail address in your comment to be eligible. comment moderation is on so if you don't see your comment right away don't panic. you have till 10pm est on friday the 28th to enter. Hi Julie! Congrats on your inclusion in this sure to be wonderful book. Right now my favorite pre-cuts are layer cakes. I think they offer great versatility, and have used them in two cute tops, as well as a pieced back over the last few months. I'm so glad you asked us to go look at your MBS projects, as I missed one, which turns out to be my favorite, and that is your "The Candy Box" quilt. So cute! Looking forward to making it, perhaps one of the two baby quilts I have coming up in the next few months. Jenny & Angela are up next... they are a crafty pair of diy moms that inspire me all the time! My favorite pre-cut is a fat quarter bundle. I love how much you can do with them! And I love the Play School Quilt on the Moda Bake Ship site. I love your pin cushions! I need to make one. Congrats on the new book. I cannot wait till it comes out. I love fat quarter bundles because there is always a little left for another project. I really like your Play quilt. Its just sweet. A big OH, for the choclates, but it has to stay at that, otherwise I have to walk sideways out of my sewing room! Anyway, I would L O V E to get my hands on the new book, looks delicious, and as it's totally calorie-free, it's my kind of treat! Hi Julie! I too have a huge sweet tooth.... Congrats on the book, it looks awesome! My favorite precut is a layer cake, I think it has the most bang for your buck! And my favorite MBS of yours is the life cycles quilt, it's amazing! I love your Life Cycles Quilt. As far as my favorite pre cut, that is a hard one. I love them all. If I have to pick one I would pick the jelly rolls. I just love to look at them all wound up. It is hard for me to unwind them. I will be making some of that candy also. Looks wonderful. Being a quilt newcomer, The only precut I've ever used is a fat quarter, so I'll say that's my favorite... would that help me make that fabulous Life Cycles quilt of yours?! That's my favorite! And my favorite project of yours it the Candy Box quilt. I've had that one printed and sitting on my magnet board for months! I just have to pick the right fabric to use. I LOVE it! Congrats on the book - all good things! Congrats on the book. I love all of the MODA pre-cuts, but my favorite would have to be the layer cakes because they are large enough to use in about any project, and provide you with 4 charm squares. Love your play school quilt at Moda Bakeshop. Wow - Congratulations on being published. I have used your MBS tutorial to make a signature quilt. Have not been quilting very long and made one for a going away for one of our Marines. My favorite precut at the moment is the jelly roll :-) Working on the Postage Stamp Quilt Along with Rachel and it has been so easy working with these precuts! Those chocolates sure look tempting! My favorite precut is the jelly roll. Though it's not big pieces like a fat quarter, it's quite versatile and so long as you don't mind the collection of fuzzies you'll be wearing thanks to the pinked edges, you can do a lot. My favorite project of yours? The Cushion Coture pillows. I love the designs, but those colors really draw me in, too. Thanks so much for a chance to win! Hmm...is it good to be first..I'm thinking yes! My favorite is the Life cycles quilt all the Play quilt is right behind. I love jelly rolls, it so nice to just pick it up and start sewing! But I have had your Life Cycles quilt on my list of things to make. I just love it!!! My favorite precut is the charm pack. I just love to collect them. You have great projects on the bake shop but I really like the cushions and the giant pincushion. Congrats on being a part of the new Moda Bake Shop book. I am drooling more from your fabric pictures than your recipe, but I don't have much of a sweet tooth! My favorite precut is a jelly roll; I just think there's SO much in them and they're so versatile (FQ bundles would be the next but I get more hesitant to cut into those!). My favorite project of yours is the candy box quilt. That would be great to showcase big florals. My email address should be linked in my blogger profile but it is tenquilts at gmail dot com. I grew up around Philly also! Thanks for the chance to win and congrats on the book! I usually use Fat Quarters or Charms. My favorite being Charm Pack. Love how versitle they are, and cheep too!!! I recently used my first jelly roll and it was super nnice not to have to cut so much. But I wold like to try a honey bun too. My favorite project of yours is the pincushion. Gotta go try that one out! I have loved visiting these blogs, I've got to learn loads about quilting already. My favourite pre-cut is the jelly roll, they are so versatile! I cant get enough of them. My favourite project of yours is the The Candy Box Youth Quilt, I love the colours and its such a cute pattern. I ♥ turnovers and jelly rolls. I love scrappy quilts and making stars. I love your large pincushions.....I gave them for Christmas to my quilting buddies. Congratulations on the book and thank you for sharing your talents. I still say that layer cakes are my favorite. It's the first precut I worked with, and I'm having a hard time replacing it as my favorite! I like your coupon clutch the best, I have added it to my list of projects. I love layer cakes. You can cut them anyway you want. I like your pin cushion.. I need to make one!! Love the chocolates... Need to go make some!! It's hard to pick just one of each, but my favorite precut is the fat quarter bundle and my favorite project is your Life Cycles quilt. I love jelly rolls! I also love your giant pincushion. I love the fat quarter bundles. I can use them for the project I'm working on and then there's a little bit left over to inspire something else. I love your "play" quilt! I love fat quarters and jelly rolls best, I think. I love love love your big fat pincushion. I've made several of them, sometimes adding a big fabric covered button to the center. They make great gifts. Congrats on the book. I'm eager to see it in person. I love jellyrolls. They are just so much fun and so versatile. I remember when your Play School Quilt came out a year ago! I love how the letters are done. Very fun! I really love the charm pack. It allows me to kind of test out a fabric line before making a bigger investment. And I love your life cycles quilt! can't wait to see what you made with that Punctuation. The candy looks fantastic. My favorite precut would have to be the charm pack...there's just so much you can do with it! My favorite project of yours is the Life Cycles Quilt. It is one of the first projects I saw when I started reading the Bakeshop and I fell in love with it (and it uses one of my all-time favorite lines). It's such a cool idea and one that is on my list of projects to try. I'm loving this progressive dinner party. Out of your projects, which is my favorite. They all are lovely, but I really like the pillows out of the Sweetwater collection. My favorite pre-cut? Charm squares for sure!! I'm very new to quilting but so far am loving charm packs and jelly rolls, they seem very versatile! My favourite project of yours ho be the life cycles quilt, absolutely adorabe. Congratulations on the book, I can't wait for it to come out! My favorite precut is the charm pack because it is such an affordable way to get a whole collection to sample. Congrats on being in the book! Love the Life Cycles Quilt on MBS. I have only used the charm packs and love them! Looking to use the layered cake though sometime in the near future. Your play quilt is adorable! Love the cushions too! Good morning all! I am enjoying all these recipes! I LOVE LOVE LOVE chocolate! I cannot wait to try this recipe out! My fav tutorial of yours is the Flower Table runner! and my fav pre-cut is the jelly roll, or the fat quarter bundle, or maybe the charm pack...it's so hard to choose a favorite! you can reach me at fgrierson at hotmail dot com, hope to hear from you soon! Good Luck all! Happy Tuesday! I love charm packs and jelly rolls....pre-cuts make my life so much better! Your baby quilts are so cute...especially the one for Aliyah! Thanks for the chocolate recipe and congrats on the book! Well, I don't have a favorite precut...there is a reason...I've never USED any precuts! LOL....does that count?? I love your Life Cycles quilt 'recipe', it's so cute! (So is the baby in the picture). 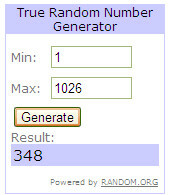 Thanks for a chance of winning, and for a fun blog hop. Congrats on the book, can't wait to see what your project is! I've never used a honey bun - charms are my addiction. I must have missed your Flower Table Runner when it was first posted on Moda but I'm going to have to make one now that I've seen it. Love it! very unique. Could also use the recipe for placemats. Thanks! Aliyah's quilt is my favorite -- AND what a sweet baby! I have a couple of honey buns and matching charm squares just waiting for me -- guess they are my favorite right now. Congratulations on the book! I really enjoy following your blog! TODAY my favorite would be charm packs because I stayed up late (for me anyway!) last night cutting out squares to try to make a quick table runner today if I have time AND I CUT MY FINGER WITH MY ROTARY CUTTER -- if only I would have had a charm pack with reds pinks and whites in it ......my favorite MBS project of your is the Aliyah baby quilt with that sweet baby laying on it ! who could resist that ????? thanks for the fun ! Yum! those chocolate treats look sooo good. I love all precuts, but especially charm packs! I love your giant pin cushion and the "play" baby quilt. Thanks for the chance to win. 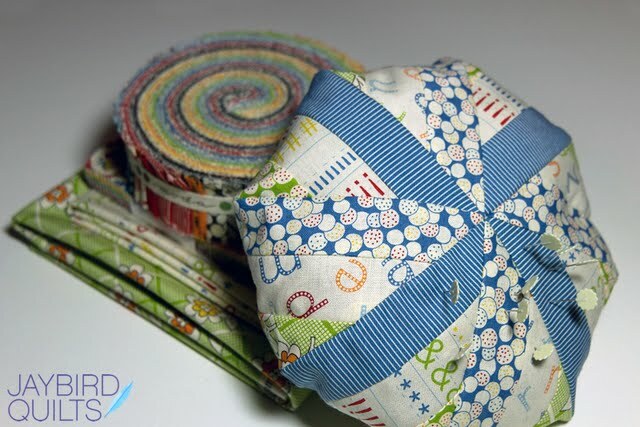 My favorite precut is the fat quarter bundle because of it's versatility, 2nd up would be the jelly roll. My favorite project of yours, Julie, is the Essence Turnover Topper. I'm thinking this would be a fast easy baby quilt with the addition of a border to make it a bit larger. Maybe one to send to Australia? I'm definitely bookmarking it. Thank you. Congrats on the book and thanks for the recipe - I mean who doesn't like chocolate anyway? My favorite precuts are fat quarters because I like using the same fabrics on many projects. I made a twin size version of the Candy box quilt for my daughter this past Christmas. It was a big hit. I love layer cakes because they are so versatile. And I adore your large pincushions. Congrats on the book! I love your Candy Box quilt. My favorite precut? Well it is hard to pick just one but today my favorite are the layer cakes. i luv jelly rolls cuz i luv anything strippy and stripey!! i luv your giant pincushions! i made some for xmas and they were a big hit! i luv your blog-thanks so much! Hi, Julie! I like FQ bundles because you have bigger pieces of fabric, but charm packs fit my budget right now. I love the coupon clutch! Thanks for the tutorial and PDF for the dividers. Perfect timing! I just told my husband last night that I need to make one and wha-lah a pattern and tutorial just waiting there for me! Thanks for always sharing your talents with us. My favorite project of yours has always been hands down the Life Cycles Quilt. It is such a neat idea and I love it a lot! hi julie~first off before i forget, my fave project of yours from the mbs is the life cycle quilt, love it! My fave precut, i would love to say fqb, but alas i have never owned one, so i would have to say a layer cake. keep up the good work, i look forward to all you do in the future. Right now, my favorite precuts are charm packs and fat quarters - because those are the only two I've used so far. My favorite project of yours on the MBS is the Candy Box quilt. This is fun! Thanks so much for the opportunity to win! My favorite pre-cut is the jelly rolls. . .I'm enjoying alot of projects that used 2 1/2" cuts so it is great to not have to cut twice. The pincushion pattern that you posted was wonderful. I have it slated to use for several gifts. I love jelly rolls. I also love your coupon clutch pattern the best. I am definitely going to make it soon. Thank you for this chance to participate in this wonderful progressive dinner. I am new to quilting and have only used a jelly roll so far. But I just ordered some charm packs because my next project is from the MBS and it is super adorable so I may love charm packs really soon. My favourite of your designs is probably (if I had to choose) the Candy Box quilt. The colors and pattern are sooo cute! Can't wait to see what your project in the book is! My favorite pre cuts are FQ because they are perfect for small projects. Those chocolates look pretty yummy! It is hard to pick one favorite from your tutorials, but if I must, the Play School Quilt is my choice. My favorite pre-cut seems to be the layer cake. If I can catch one on sale, I can fit it into my budget and it seems to have the most flexibility. My favorite project of yours is the candy box quilt - it's on my to-sew list! Fat quarters ... woot woot! I really like the flower table runner ~ it would be so much fun to have a different flower for every month of the year (hmmm, I'll add that to my "to do" list). My favorite pre-cut is fat quarters! They're large enough to give me plenty of fabric to cut and create with instead of being confined to specific sizes. I LOVE your Play School Quilt and the Coupon Clutch! Both have been on "to make" list for a while now. I like Charm packs the best. And I love your coupon clutch! My favorite precut is the layer cake. My favorite project of yours on Bakeshop are the cushions you did with Quilt Dad. I think your projects are wonderful. I love your quilts! 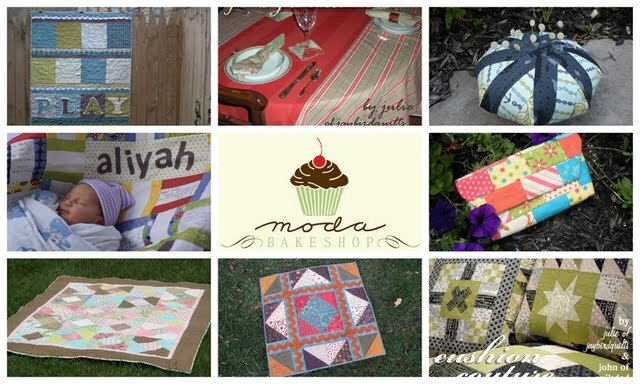 In the Bake Shop, I'm partial to the Aliyah quilt maybe because of the adorable baby swaddled on top!! I collect charm packs to play with and occasionally I even make something with them! My favorite precuts are layer cakes, and I LOVE your flower table runner. Darling! THanks for the opportunity, and the second chance cuz I messed up my first post! Hi Julie! I love your projects...but I must say that the giant pincushion is the best I have seen! Now I want to make one! As a beginner quilter, I have only made one quilt, so I would have to choose charm packs as my favorite cut at the moment. I love charm packs best!I can't seem to find honey buns here in the UK at all! I love charms! My favorite of yours would have to be the Candy Box Quilt! I have to say my favorite precut would be FQ's, just for the sheer amount of fabric, but the Charm Packs are so darn adorable!! And I love, love, LOVE your Giant Pincushion. My favorite, by far. I like fat quarters the best. They are so versatile and easy to make pretty much anything out of! My favorite project of yours is probably the Sweetwater Flower Table runner. I hadn't actually seen it before today and now I want to go and try one for myself! Thanks! I am a FQ person; I love big blocks and large applique!!! I love chocolate, layer cakes and your candy box quilt. Congradulations on your book! Hi Julie, thanks for your website it's so helpful. I am a beginner quilter and have needed to refer to it A LOT! Anyway my favorite precut is jellyrolls, my very first quilting project used one and I made a wee spin hexagon quilt which I took apart and redid thanks to your tutorial!! So cute still have to handquilt but that's ok. Also my favorite project from the Moda shop is the giant pincushion, I will be making me and my mom one of these asap!! I love all your recipes over at the bake shop, but I think my favorite is the candy box quilt. It's CANDY, so naturally it would be my favorite! 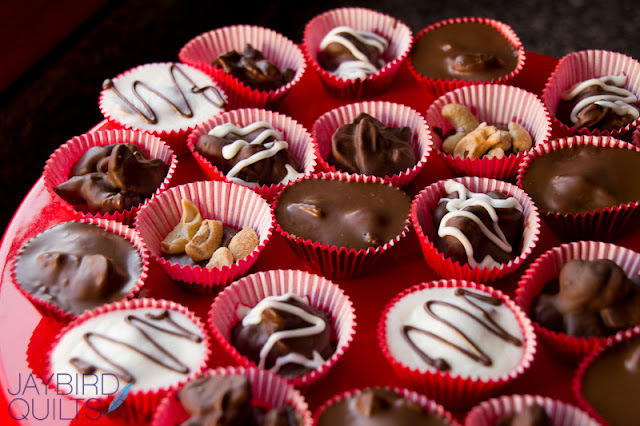 Your candies look fantastic and just in time for Valentine's Day! My favorite precut would have to be a toss up between charm packs and jelly rolls. I'm just using my first jelly roll in your bff's quilt along and cannot even begin to say how much I love the idea of having strips of the whole line of fabric all ready to start sewing! This new book looks fabulous and I sure would love to get my hands on it so I can see all the projects. Congrats Julie on being featured in the new book! I can't wait to see what your project is....I may have to pre-order that kit! My fave pre-cuts are layer cakes and Jelly rolls however I do collect Fat Quarters too! Since I just found out I'm expecting another baby, I'd have to say that I adore your Play School Quilt! I'm definitely going to try that one! Thanks for the chance to win such a fab giveaway! I love the candy box quilt the best. It's a nice, graphic pattern. As for pre-cuts, I have only worked with fat quarters and layer cakes. Layer cakes are my favorite! My favorite project of yours is the Candy Box - maybe because I like anything sweet including your chocolates! Fat quarter bundles are my favorite precut because you can do so many different things with them. I love the jelly rolls and your giant pincushion is just what I need - the bigger the better. My favorite precut is the charm pack. and my favorite project of yours from the bake shop is the Cushion Couture, you can never have too many pillows. I can't decide which is my favorite project!! I've got it narrowed down to the coupon clutch (I'm a huge cuponer) and the play quilt! My favorite precut seems to change and is currently layer cakes. I just love your Life Cycle Quilt. Charm packs & jelly rolls-gotta love 'em! I really liked the pillows you did with Quilt Dad. Contests on being in the book & thanks for the recipe! My favorite precut is the layer cake or the FQ bundle (can't go wrong with that, right?!). I love the giant pin cushion (and Neptune!) but I also really like The Candy box! Thanks for sharing your time and talent! I'm attempting Block-a-palooza! I like charm packs best (but if in a bind, I will purchase a layer cake and cut it). I have been known to whip out a quilt in a day or two using charm packs. 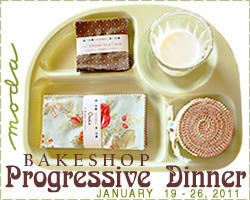 I have made your coupon case (from Moda's Bake Shop), so of course that is my FAVORITE of your postings. Made a few and gave them as gifts to a few thrift friendly friends. Thanks for your ideas and your postings!! Julie, I can always something I want to make from your blog. My favorite precut is the charm pack because I can see the whole line of fabric for a small investment and then decide which ones I want to order. I love your Play quilt and plan to make one for the grandson we are expecting next month. My fav for the moment is a jelly roll (loved it as the center of your flower table runner). Fav project is the giant pincushion. One can't have enough of those. The only pre cuts that I've worked with is Charm Packs, so they are my fav right now. And I loved your Cushion Couture pattern on MBS. Loved the fabrics your chose. Thanks for sharing such great patterns. The book looks fabulous! I think my favorite Fabric pre-cut is the fat quarter bundles. My favorite Project of yours is the sweet water flower table runner.. although all of your projects are beautiful!! Thanks so much for doing the giveaway. I am currently loving the layer cakes. But, your giant pincushion may change my mind a bit. My favorite pattern used to be the Play quilt. But, after seeing your giant pincushion, I've changed my mind! I haven't seen that one before. How in the world did I miss that one?!? I love jelly rolls! They are sooo pretty! (I use FQ bundles more, but the jelly rolls look so nice on the shelf, lol). My favorite project/tutorial of 6yours is definetly the play school quilt, I run a preschool, and have 2 little ones of my own, so this one was just to adorable to pass by! My favorite precut is the jelly roll and my fave project is the Play Quilt. So cute! My favorite pre-cut is the layer cake. It's so versatile and cheaper than a FQ bundle for an entire collection of fabric. And my favorite tutorial of yours has to be the coupon clutch. So much more personality than the plastic folders you can buy at the store! Hi! 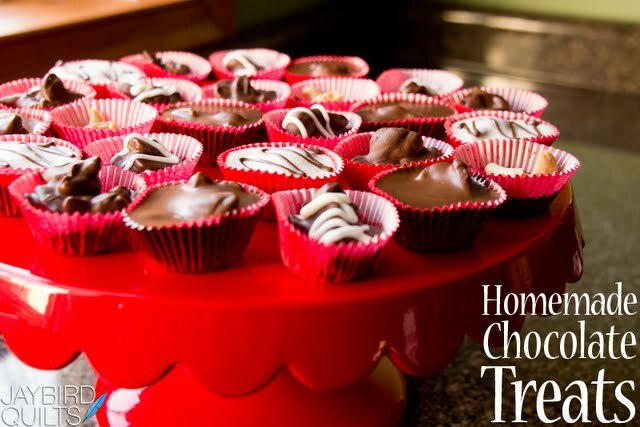 Thanks for the chocolate candy recipes!! I love things that look hard to make but are easy! As for pre-cuts... love them all but I would have to say fat quarters as they give you more bang for your buck. Truth be told, I usually dont have that many bucks so I am more apt to walk out with charm packs! I really do like your tutorials on Moda... the pin cushion is my fav! My fav precut is the fat quarter bundle since you get do much fabric...but that's not affordable when there are so many great collections...so I usually get charm packs or layer cakes! My favorite project(s) of yours are the giant pincushion and the play school quilt. Congrats on being in this great book! I love your "Cushion Couture" pillows - a great project for scraps. As for the pre-cuts, I lvoe fat quarters best because they are so versatile, but I'd never turn down a layer cake, jelly roll,honey bun, or charm pack - fabric in any form, really! the only pre-cut I have ever worked with is a fat quarter, but they all look fantastic, I'd love to try another, but havn't found them at my stores. I love your coupon clutch, I'm a coupon girl myself. Beyond the baby phase, as cute as your baby items are. I like jelly rolls the best. I also like your giant pin cushion the best. I prefer my projects to be useful. I love all your tutorials, but I would say my favorite is the essence turnover topper - so cute and easy enough to finish some up as gifts! And I absolutely love the rick rack added to it. So ya, I can't wait to see your project in the book - the fabrics you chose look great! My favorite type of fabric buy would have to be the charm packs. They're ready to go or just require minimal cutting. I love scrappy quilts, so they fit the bill for me. My favourite pre-cut would be charm packs because I can always find so many things to do with them and there always seems to be just the right amount of squares!! I love the Aliyah quilt.but then I'm in the process of making one, so I'm biased! Thanks for the giveaway! This progressive dinner has been fun. My fav pre-cut is the charm pack and I love your coupon clutch! I love the Candy box quilt. The precut I buy the most if I don't know what project I am going to do is the layer cake. CONGRATULATIONS! I'm a fat quarter fan. Always will be, I think. I love that I can get 2 layer cake squares plus some charms or strips for binding, or a whole bunch of charms.... ah... possiblities! I'm also LOVING that play school quilt! I don't know if that had caught my eye before but it's a MUST-MAKE for my 2 year old! I would make the Candy Box quilt and I love jelly rolls. I like the layer cakes. And I love your turnover topper! I love your Cushion Couture patterns, I haven't made anything yet but have had it on my computer for a while. I love jelly rolls mostly but also charm packs and layer cakes......I could go on but I won't! I love the punctuation fabric too. i LOVE the Giant Pincushions. and i think i just bought the right fabrics for it. i love the charm pack. i love the variety you can make from them. I love the fact that we are allowed only ONE comment! My favorite precut would be the jelly roll, yesterday it was fat quarters! I like them all and find it hard to pick! And I like your Candy Box Quilt. It's cute and like you I love candy! Thanks for the chance. I love your life cycles quilt. I've never thought about writing on a quilt before, but it's a great idea and would be such a treasure. I've never used a precut before, but I think I'll probably start with a charm pack. My favorite precut is a fat quarter bundle, but when I need to spend a little less money, I usually go with a jelly roll. My favorite bake shop project of yours is your "candy box" quilt. I am loving jelly rolls right now. That said my favorite pattern of yours is not from a jelly roll. I love the big flower table runner! I am looking forward to the book! My favorite precut is the jelly roll. I love all of your projects but I'd say right now my favorite would be the pillows because I desperately need to make some and they are all adorable! My favorite pre-cut is the layer cake. I LOVE the Aliyah quilt, I plan to make it for the next friend who has a baby. PS - The chocolate treats are yummy! I'll have to make some soon. I like layer cakes and jelly rolls. I love your coupon clutch. These little bags are so handy for all sorts of things. Thanks for the tutorial. I like your pillows best, and my favorite pre-cuts are jelly rolls and layer cakes, depending on my mood. OK, I really like fat quarters-alone or bundled. And I think your candy box quilt is adorable and I also like your coupon clutch. And I really would like a chance to win-thanks! My favorite project of yours has to be the Play Quilt. So darling! I hadn't seen the flower runner before - love that as well. My favorite pre-cut right now has to be the layer cake. My favorite pre-cuts are fat quarters, but I may have to buy a charm pack just so I can make your coupon clutch. All your tutorials look great, but that one is my favourite. I love the jelly rolls. They are addicting! I love your play school quilt. My favorite project of yours for MBS is the Coupon Clutch - I made a bunch of them for presents and they were all well received! so I'm not entirely sure that I can pick ONE from either category! I love all the pre-cuts - I am newish to quilting so I have had the most experience with jelly-rolls, but I got my first layer cake not too long ago and am loving that too! And there is NO WAY that I could pick One for my favorites of your recipes. I was literally discussing your Life Cycles quilt last weekend with someone - how cute and simple - I have playschool marked as part of my to do, I love the sweetwater flower table runner and have been wanting to do that one for a while (cannot find the actual fabric so I'm stalled there), and I could just go on and on! Thanks for being so creative and modern! I love the fat quarter bundles! And my favorite project of yours is the life circles quilt. What a great idea! I just love it! I think I switch which is my favorite every project I do! Right now I am loving layer cakes. I adore your sweetwater flower table runner, I love the dimentional aspect to it. Hey there Julie - my favorite pre-cut is fat quarters and my favorite project of yours is the Giant Pincushion. I have made several of them. My favorite precut to buy is the FQ pack, but I also love jelly rolls and layer cakes. My fave project of yours is the Candy Box quilt. I make a lot of youth/baby quilts. I also like the pillows (cushion couture). Congrats on the book! I like your candy box quilt (how fitting, with a chocolate candy tutorial today), and my favorite precut is a fat quarter bundle (lots of fabric) or a layer cake. Love American Jane fabric! My favorite pre-cuts are fat quarter bundles. I just love looking at the layers of complementary fabric. My favorite tute of yours at Moda is the coupon clutch. I love charm packs they are just the right size, I love your coupon clutch it is so cute and so fun. My favourite at the moment are charmpacks. Great for my small projects. I love your candy box quilt very much, but it is really hard to choose just one! Thanks for the wonderful desert! The sweetwater flower table runner has to be my favorite, beautiful! My favorite precut: layer cakes! Just enough of such a variety of fabric to do almost anything! Congratulations on your book launch! Right now my favorite cut is the charm pack. Your pincushion is super cute. I like almost all of the Moda Pre-cuts but I think I'm leaning more towards charm packs and layer cakes. I love the pillows you did with John and am planning to make some using Sweetwater's Pure. My favorite pre-cut is the layer cake (and cake happens to be my favorite dessert). I absolutely love your candy box quilt, I think it would also make a great lap quilt for anyone, not just kids! I love your Life Cycles quilt - its such a great baby quilt! I'm a charms person - I love that you can get so much for just a few dollars...a little taste of all the fabrics in the line. Congrats on being part of this book. My favorite project of yours in the Moda Bake Shop would be the pillow project... one can never have too many pillows! I'm pretty new to all this quilting stuff, but I think the layer cake is quickly becoming a favorite of mine. It seems very versatile to use. I like the Life Cycles quilt! My favorite precut would have to be a JR, or maybe a LC or maybe a FQ bundle.....so many choices, llove them all. I love layer cakes! And I really like your PLAY quilt. Congrats on being in the book Julie! My favorite precut is charm squares! They are the 100 calorie packs of my fabric world. My favorite project of yours is the Play School Quilt. I'm a sucker for rickrack! I'm very new to precut fabrics, so I'm not sure how to answer your question. I jsut got my first jelly roll and charm pack for christmas. But I think I'll say fat quaters are my fav because you get a much bigger piece of fabric to work with. As for your tutorials I really like the cushion couture. I'm loving stars right now. Congrats on the book! I love layer cakes and your family traditions table set. That's a dinner I'd like to be at! My favorite pre-cut is fat quarters because I love the leftovers. My favorite project of yours is the pin cushion, and I've made it several times. I think I'm tied between FQBs and Charm Packs as my favorite pre-cut. As for my favorite project that you've done on MBS, I'd have to go with the coupon clutch. I made two already and i use one to carry my quilting tools instead of using it as a coupon clutch. I love layer cakes because of their versatility - as is, or cut into other pre's. Favorite is the coupon clutch - works up so quickly and was a favorite little gift at Christmas. I think your life cycles quilt is absolutely fantastic!! I've got a soiree honey bun, that would be so cute in this pattern!! You know it really is too bad that honey buns aren't availible in as many collections now, they're great... and wouldn't they be fantastic in the bella solids? Would save cutting those little strips since they really are too thin to rip the strips. Just a thought. Thanks for all your tutorials, they are great! My favorite precut is charm squares. And I would have to say the coupon organizer for the pattern I like best! I love your big pincushion and I love jellyrolls, seeing all those colors swirled together really gets my creative juices flowing. I like fat quarter bundles with charm packs coming in a close second. Your Play School quilt is my favorite of your MBS projects. Thanks for the chance to win and congratulations for being a part of the book! Love the layer cakes the most. Also I'm a huge fan of your Cushion Couture project. My favorite pattern has to be the Play School quilt. I think I could do that one (new to quilting!!) So far I think my favorite pre-cut would be the jelly rolls or layer cakes. Can't wait to see the book! My favorite pre-cut would be "fat quarters." I like that little stack folded every so neatly! Your chocolate treats look devine - but I have to refrain as I need to lose weight befoe the annual doctor visit! Thanks for sharing your tutorials. My favorite is the coupon clutch - practical and pretty! Thank you for the giveaway and congratulations on being in the book! My favorite pattern of yours is definately the Life Cycles quilt - it is awesome. My favorite pre-cut are fat quarters! Thank you! 2. I love the Cushion Couture! Hi Julie - congratulations on the book, it looks fabulous!! My favourite pre-cut is the jelly roll, love the possibilities! And I love your Candy Box quilt on MBS...gorgeous! Can't wait to see the book!!! Thanks for the candy turtorial! It looks do good. I really love your Cushion Couture! Love the design and the colors. I guess my favorite pre-cut is the charm pack because that is what I have used the most. I would love to try a layer cake but have not been able to do that yet. Thanks for letting us play along with the announcment of the new book. Congrad's! Well, fat quarter bundles are my favorite ofcourse! Isn't more fabric always better? But I'm also liking fat eighths & layer cakes for the budget. I love your sweetwater Authentic flower table runner. So cute! Thank you! Congratulations on the book! I can´t wait to see the rest of the projects in it. I love all the precuts, but I think the scrapbags are my favourites. Though I really like all your MBSprojects, the Play School Quilt is my favourite. Thanks for the opportunity. I love jelly rolls. I'm not sure why I just can't help myself when I see them I usually buy another one. I love, love, love the coupon clutch. I made it and was so happy that you even gave the templates for the dividers. I needed a new coupon holder so bad! 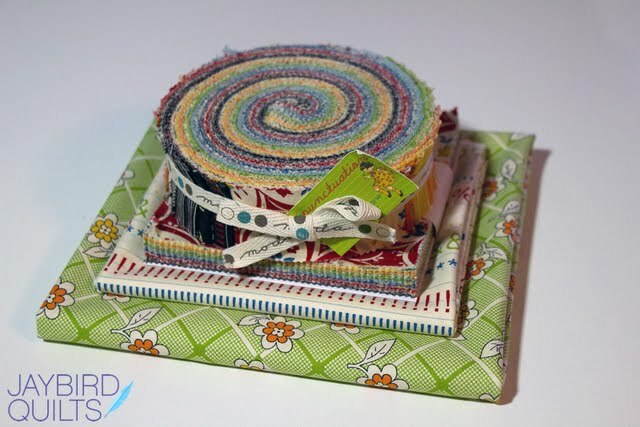 I love jelly roll, not too expensive but there's so much you can do with one! I like your baby quilt pattern. I made one for my cousin last week! My favorite precut are the fat quarter bundles -- plenty of fabric! My favorite project is the candy box quilt. Can't wait to see the book! I love your site and can't wait to get my hands on the book!!! I would very much like to win but I'm happy for anybody who wins. I hope everything is going well with your family now! I'll continue to pray for them. My favorite MBS project of yours is the essence turnover topper...very cute! My favorite pre-cut is the layer cake, but I also love FQ's. Congrats on the book too! Your pincushion is my all time favorite - and layer cakes are my favorite pre-cut. Congrats on being featured in the new book! A well deserved congratulations for being included in the book. My favorite precuts are jelly rolls and layer cakes. I love your Candy Box quilt, but partial seams give me hives. One of these days I hope to be brave enough to try it. I like layer cakes and charm pack for the manageable sizes of the fabric. I love your coupon clutch--I may just have to whip one up soon! I love charm packs and jelly rolls. My favorite project of yours is the Candy Box Quilt. Congrats on the new book! I would love to buy as many layer cakes as are made, I love them so much, but since they don't really fit my budget ;) I buy charm packs as often as possible and drool over the "what ifs" and dream of the projects I could make. As for your projects on MBS, I printed out your coupon clutch last week, really cool, but I think my favorite would have to be the flower table runner. Love it! i love fat eigths bundles...and i love your giant pincushion! i LOVE fat quarter bundles- but they are usually out of my price range so I most often settle (as if you even have to settle for anything Moda!) for charm packs- I love how many different things you can make with little 5" squares. I love the PLAY quilt! If money were no object, then the fat quarter bundle would be my favorite pre-cut. Unfortunately, living on a budget, I find I get my fix for a new line most frequently via charm packs, which are so useful and let you enjoy all the fabric in a line in little doses! And my favorite project of yours is the Play quilt. I really want to make one for my granddaughter! I love your "Play" quilt. Being fairly new to quilting, I have only used charm pack precuts. I have a quilt in mind that would use a jelly roll so that might be my next purchase. Thank you for a very fun and generous giveaway. My favorite precut is a fat quarter bundle because each fq is large enough to make several blocks and larger sized blocks, there is a variety of colors/prints, and it comes tied with a pretty ribbon! Your Moda Bake Shop project that I continue to like the best: Life Cycles Quilt for Aliyah. Congratulations on a well-deserved "published" achievement.